This has been a big week for Fed speakers, but big economic data arrives next week and another matter overrides: the interagency climate report released last Friday — on Black Friday to avoid public notice. Thus today is the annual Third Rail issue: for the first time in 30 years of publishing, write about climate. First the Fed. On Wednesday Chair Powell delivered a brilliant and reassuring speech, linked here, addressing financial stability. Markets of course ignored that part and focused instead on a correction made by the Chair. 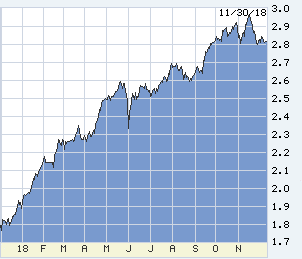 Last month Powell said that the Fed’s cost of money was “a long way from neutral,” and markets reacted badly. On Wednesday without reference to his prior remark Powell said the Fed is “just below” neutral. Many in markets think that this revision was a policy shift. Not! Powell had said something casually, was misunderstood and fixed it. Ben Bernanke slipped on he same banana peel in his first term. All Fed Chairs know that markets hang on every word, but the necessary discipline is superhuman and takes time to master. Some still think that the Fed has pulled back its future intentions, but the bond market has not moved. 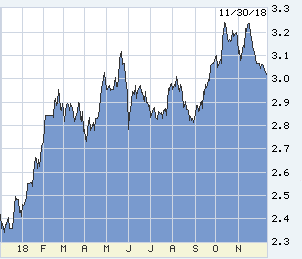 The 10-year is off its high, tested 3.00% but failed to break below, and the Fed-sensitive 2-year has not moved at all, still forecasting two more hikes before a pause. Powell’s speech is worth your time, especially the charts at the end, and this companion report, the Fed’s first on financial stability. There are a few minor credit excesses, but the report is very different from the Wall Street crap designed to frighten you. Powell gave us this list of top risks: “Discussions with contacts currently point to risks emanating from the normalization of monetary policy in the United States and elsewhere, the unsettled state of trade negotiations, Brexit negotiations, budget discussions between Italy and the European Union, and cyber-related disruptions.” Note the overseas emphasis. Now climate. Why touch the Third Rail? Because energy policy is central to our economy, and may soon be central to our politics. I am an expert on climate. Hah. I took Brown University geology 1967-70 partly because people who grow up in Colorado enjoy rocks, and to avoid physics and chemistry. Surprise, surprise: I got physics, chemistry, paleoclimatology, planetary astronomy, and the rocks. Before policy conclusions, begin with the widest possible context for Earth climate. 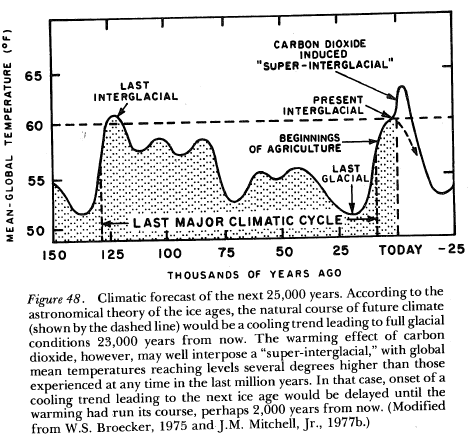 Imbrie’s readable 1979 “Ice Ages” (Amazon has them used for a few bucks) contains one of the first postulates for a period of CO2 warming. In John’s thinking, carbon loading would produce a thousand-or-two-year extension of the current interglacial, which otherwise is due now to begin the long slide to a new ice age. For deeper climate history, try Princeton’s “Paleoclimate,” a tough read but excellent on the acute variability in Earth’s climate and atmosphere, and massive warming impact of CO2 in the long record. Be suspicious of climate activists, pro or con. 1. Our CO2 forcing is going to warm the planet. Going to. But, in the absence of any prior similar experiment, and an undisturbed “control Earth” we cannot estimate the speed or magnitude of the warming or its effects. Could be faster or slower or greater or less than the dominant models. 2. Drop the hysterics about “saving the planet.” Earth is a damned dangerous place, wildly changeable and accident-prone, yet life has thrived even after extinction events. Consider one guaranteed hazard ahead: civilization appeared early in the current interglacial. No matter what we do with carbon, in a couple of thousand years it will be cold, and in twice the length of present civilization, maybe 20,000 years New York City will again be under a half-mile of ice and sea levels 300 feet below today’s. 3. Our adaptability and survival aside, only fools or crazy people would destabilize an already unstable system, inducing global warming. Thus we should do something to stop it. 4. But what? If we don’t know — can’t know — speed or severity, then how do we calibrate the economic damage we should inflict upon ourselves to de-carbon? Last week’s agency report tried to quantify economic loss if we do not act, but did not elaborate on the cost or feasibility of action. It will be expensive to relocate southern Florida (as it will be to relocate Canada and New England before advancing ice), but will that expense and non-monetary damage be less or more than the economic damage to de-carbon? 5. No matter what we do, to suppress carbon burning we must substitute other sources of energy, all more expensive. Activists who claim low-cost substitution are as deluded as the no-action people. If cheap alternate sources were available we would not be drilling and burning 100 million barrels of oil every day. 6. There are 7.5 billion of us. There will be over 10 billion by 2050. If the current 7.5 billion cut carbon by one-third — herculean — in 30 years we’ll be back where we are. The Paris Accord is do-able only by all-out nuclear, fantastic direct cost, suppressed economic activity, and a joint global effort. The UN estimate of steps necessary to meet the Paris accord includes a 90% reduction in US carbon. One alternate carbon solution, guaranteed to work: depopulate. 7. Ain’t gonna happen. Just in the US, the carbon taxes which appeal to the urban left would be ruinous to the driving-dependent rural right, part of the reason the right pretends not to believe in CO2 effects. That, and not trusting Lefties to write zillions of new and dubious regulations and to manage a honey pot of carbon-tax revenue. Internationally we have no way short of war to enforce carbon discipline. And the economics of carbon suppression are as inflexible as carbon physics: if the US stopped burning gasoline, about 11 million barrels/day, the price of oil would plummet, making it affordable for burning by others, and they would. Conclusion (applause from the crowd): we are now doing about as much as we can afford to do to suppress carbon. Bill Gates is right: we need new technology. In the meantime, climate activists would do well to cool it; the noise is counterproductive. 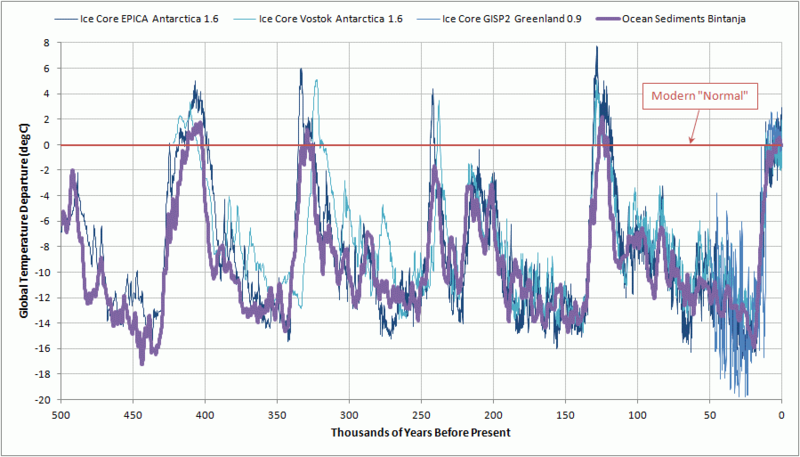 The next chart is only 10,000 years back, almost the whole interglacial. We are already cooling, beginning the long slide to the next ice age and due to steepen — if it were not for carbon. 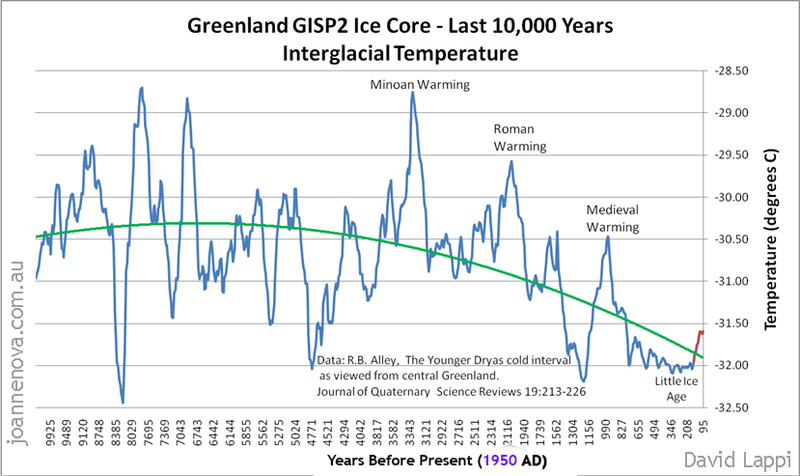 Temperature scale is negative degrees C because central Greenland, but the trend line reflects cross-verified global trend. “Climatic optimum,” about 2.5 degrees C warmer than today passed 7,000 years ago, all as predicted by orbital change and axial wobble.